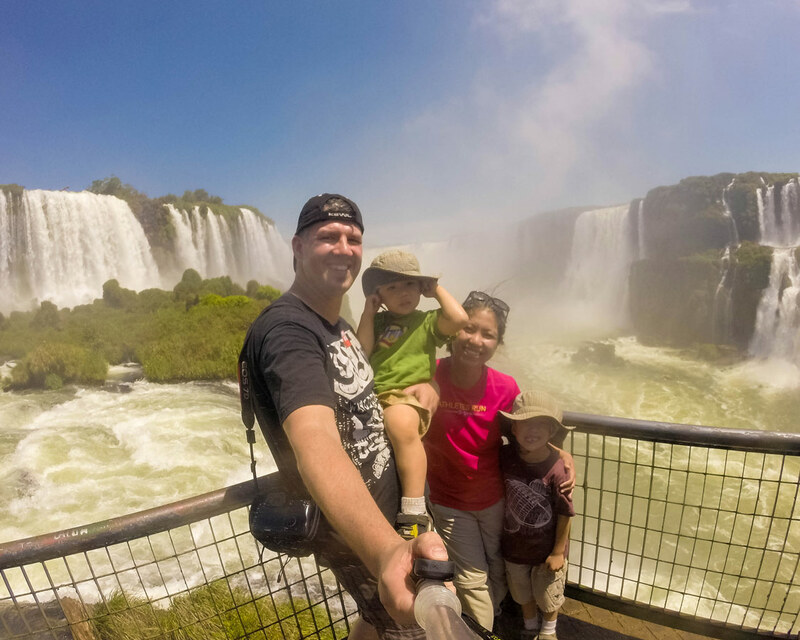 We had an amazing time visiting Iguazu Falls Argentina with our kids. We were able to get up close and personal with the majestic falls via all the walkways that are set up. Also, we got to see wildlife along the way. 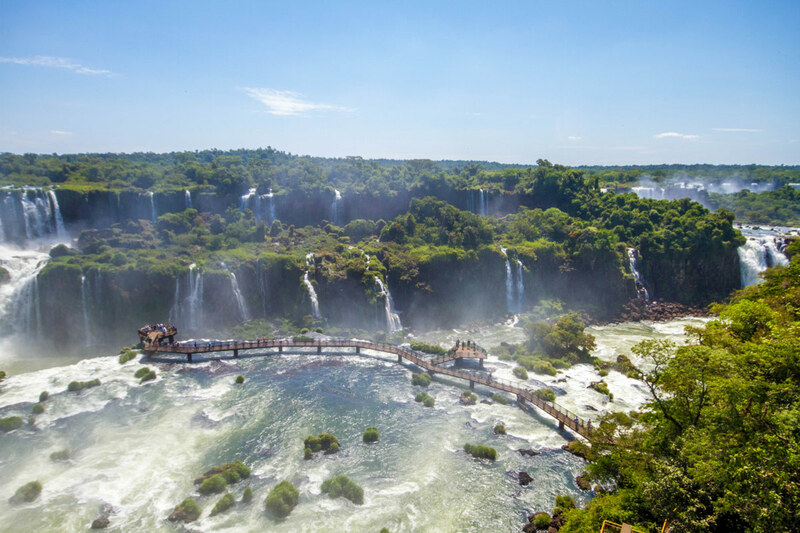 However, we couldn’t wait to experience the panoramic views of the Falls that are afforded by visiting the Brazilian side. 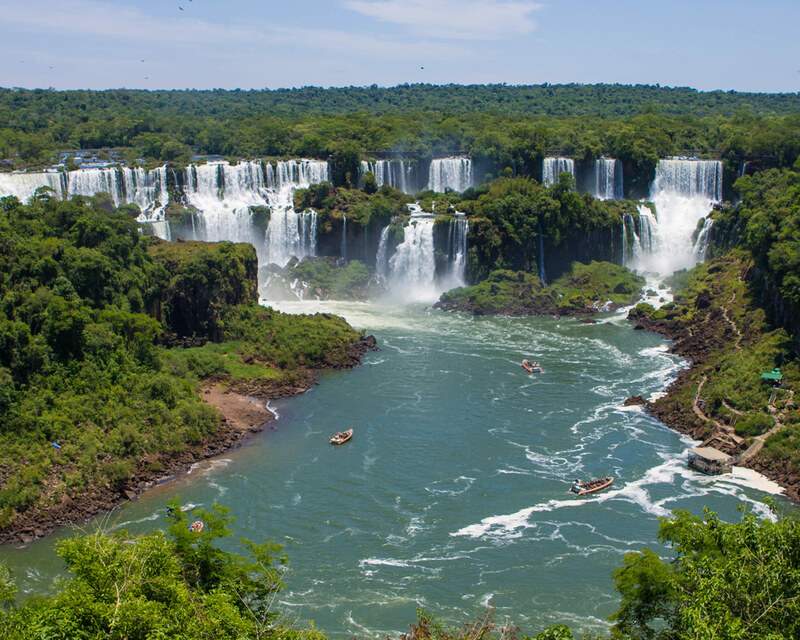 So, off we went to visit Iguazu Falls Brazil with kids as a day trip from Puerto Iguazu. In order to visit Iguazu Falls in Brazil (Cataratas do Iguacu), we needed to cross the border from Puerto Iguazu in Argentina to Foz do Iguacu in Brazil. 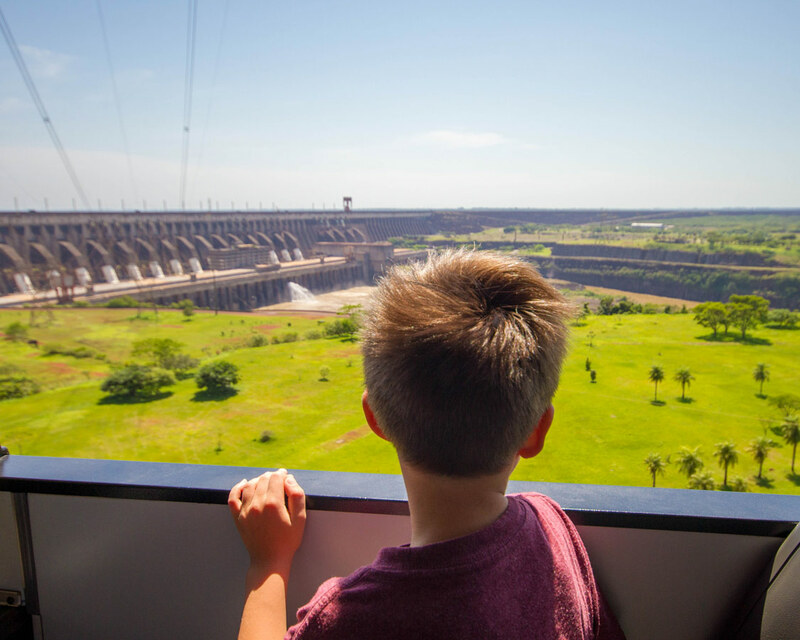 On this day trip, we also wanted to visit the Das Aves Bird Park and the Itaipu Dam. So, to make getting to the three sites as efficient as possible, we signed up for a private tour with the local tour operator, SayHenque. Early in the morning, we went for the short drive to the Argentina – Brazil border. Canada is one of the nationalities that requires a visa to enter Brazil. Because of this, we organized our visas beforehand at the Brazilian consulate in Toronto. 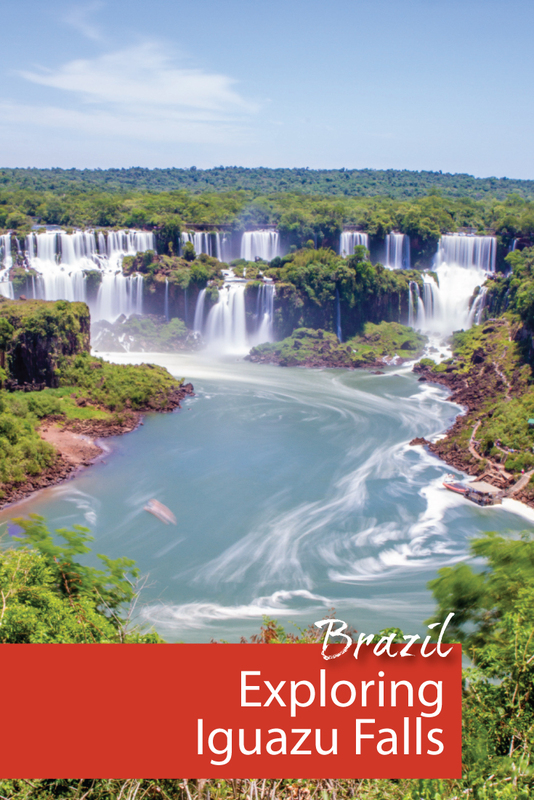 Visa requirements are one of the reasons you may choose one side of Iguazu Falls over the other. At the border, we disembarked at the border with our tour guide. Next, we entered the border control office. Luckily, as it was early in the morning, there was no lineup and 15 minutes later, our passports had shiny new stamps. Pro-Tip: Although we read that if you join larger tour groups, a visa was not necessary, this was not our experience. We saw large tour buses parked as passports of those on board were being checked. We do not recommend trying to cross into Brazil without a visa. Pro-Tip: If you would like to experience Iguazu Falls from the air, it is possible to sign up for a helicopter ride. Inquire at the visitor’s center for current details on pricing and availability. Our first stop as soon as we entered Iguazu Falls National Park in Brazil (Parque National do Iguacu Brazil) was the welcome center. This is where we needed to pay our entrance fees. As we were in our own vehicle, we didn’t have to take the complimentary shuttle bus that brings you from the visitor’s center to the various stopping points in the National Park. The start of the Black Well Hiking Trail is one of the first stops after the visitor’s center. There is a parking lot so those driving can leave their vehicle to enjoy the 9km of trails. The trail can be completed on foot or via bike. 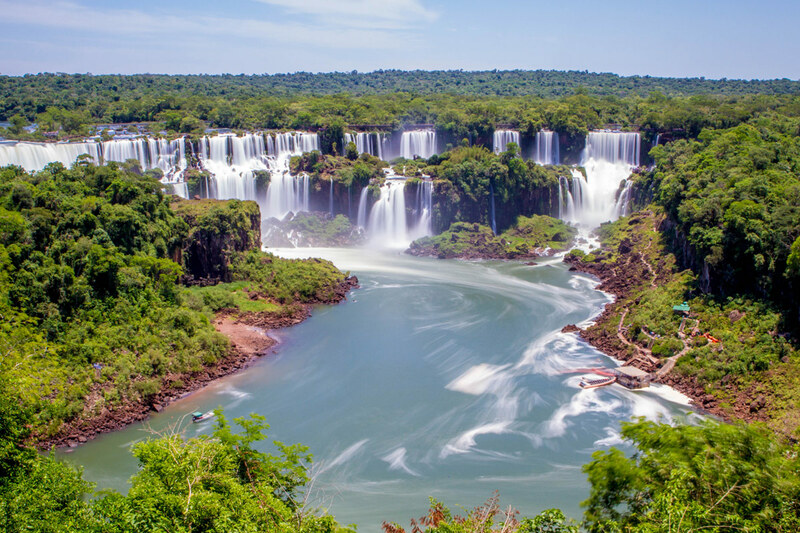 The walk offers a chance to get close to the various flora and fauna of Iguazu Falls Brazil by combining hiking with a motorboat or kayak tour. Since we had a similar experience already when we were walking on the pathways of Iguazu Falls Argentina, including the Ecological boat ride, we decided to skip this stop. The next possible stop after the Black Well Hiking Trail is for the Macuco Safari. This tour starts with a visit to the surrounding forest in an electric vehicle. Next, is a 600m hike to Salto Macuco. The tour concludes with a ride in a motorized raft that gets very close to the falls. Getting wet is a guarantee. The boys could not participate due to their ages, so we had to skip this adventure. Also at this stop is the trailhead for the Banana (Bananeira) Hiking Trail. It is a 1.5 km walk passing lagoons that allow you to view some aquatic life. We were still worn out after a full day of hiking the previous day, so we decided to skip this stop and save our energy for visiting the falls. Less than 10 minutes after the visitor’s center, we finally reached our stop for the Cataratas Hiking Trail. The trail is 1200 m long and is fully paved. 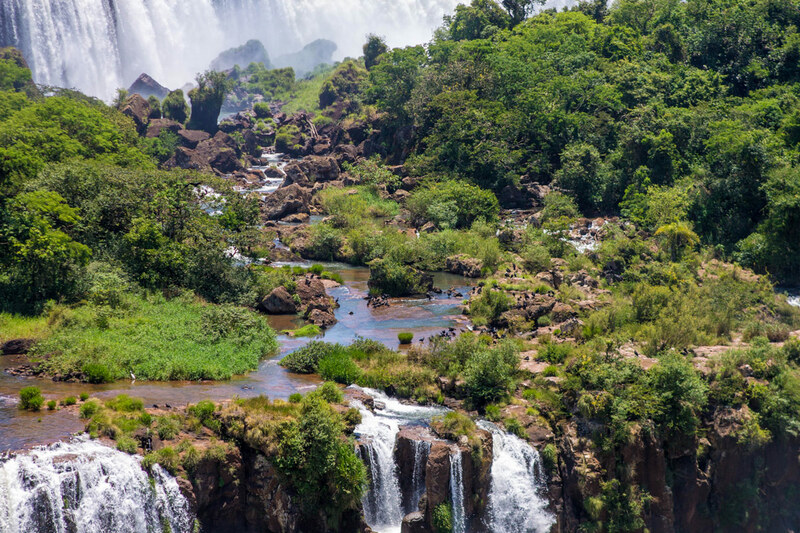 It snakes along the rim of Iguazu Falls offering unparalleled panoramic views of this UNESCO site. There are many viewpoints along the way. Some seemed to offer views of all 275 separate waterfalls that make up Iguazu Falls. 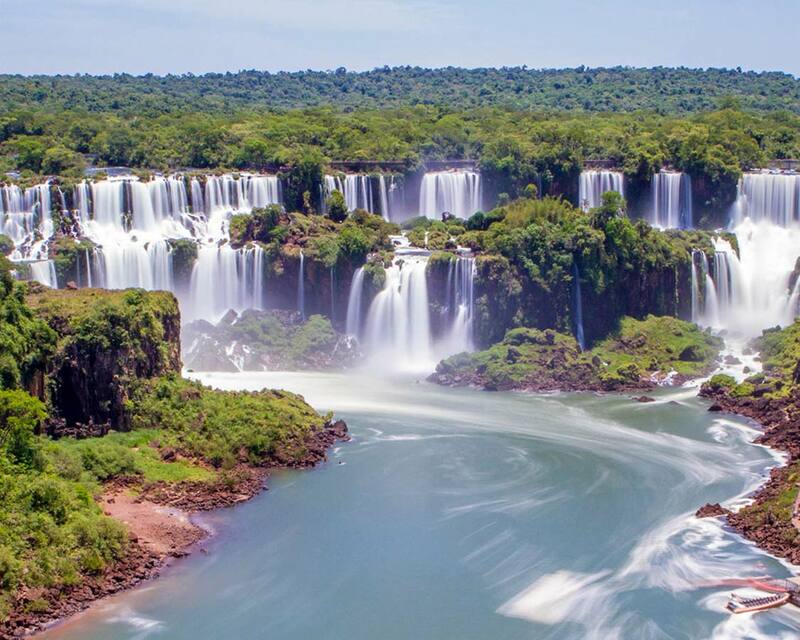 Interestingly, only 20% of the Falls is within Brazil while the other 80% are in Argentina. After a leisurely two hours, we reached the end of the trail where we had an up close view of Salto Floriano. Also, we had another glimpse of Devil’s Throat (Garganta do Diabo). Even though we were seeing this immense waterfall for the second time, we were still awestruck. Devil’s Throat is U-shaped and is 82 m (269 ft), 150 m wide (492 ft), and 700 m long (2,297 ft). Near the base of Salto Floriano, the trail branches off. A boardwalk reaches out into mist of the surrounding falls. As we made our way out, the wind picked up and the water began to drip down our bodies. Many visitors wore rain ponchos supplied by the park, but we found the water to offer a refreshing break from the heat. The wind and water near the falls reminded me of the Cave of the Winds tour in Niagara Falls. In both scenarios, you will get wet. The last part of our visit involved going up the observation deck which also leads to a restaurant and the gift shop. This seemed to be the only way to exit the Falls without having to walk back to where you started. Normally there are two elevators, however when we visited, one was under repair, and it was not very large. Fortunately, our wait was less than 10 minutes. Up next, we would be stopping at Das Aves Bird Park which is basically across the street from the National Park. WOW! I’ve never seen a broad and wide falls like this! I mean, there are photos over the internet but seeing it like this in a more human point of view is amazing. Thanks for sharing this! It is such an incredible place. The waterfalls seem to stretch out forever. It’s incredibly beautiful. Waterfalls, anywhere in the never fail to inspire feelings of awe. 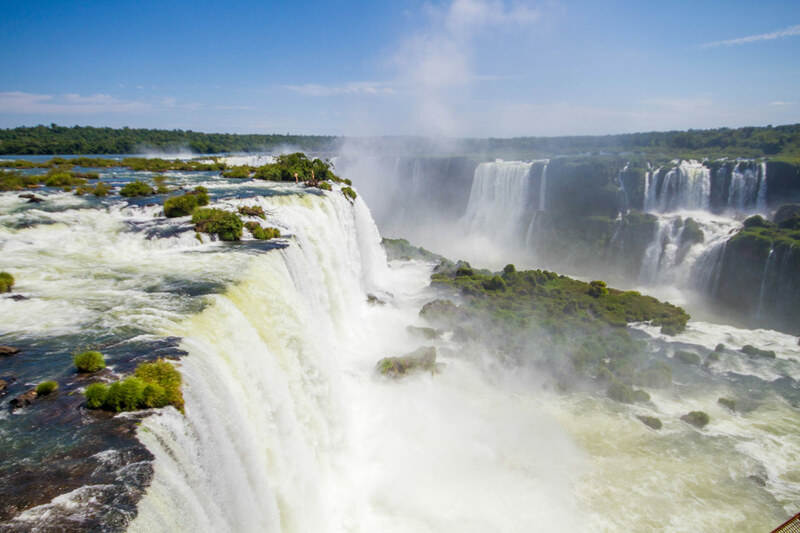 The Iguazu falls are no exception. The pictures bring alive the spectacular nature of these falls so vividly, that one can almost feel the spray of cool water and hear the thunderous roar as the water cascades down. Devil’s throat is really awesome. Oh wow! Just wow! Iguaza falls left me speechless! Not only that, your travels prove that it’s not really a huge hassle to sometimes travel with kids. I love the idea that you and your family can fully enjoy travel activities. In the future when I have kids too, I would also travel a lot with them! haha such a cute family! And by the way, Brazil is an amazing place! Heard so much about it even tho I myself haven’t visited it yet, I definitely will! Cheers! Now those are some spectacular waterfalls. They are really inspiring. We’d love the feel the mist and hear their roar. Thanks for sharing this awesome experience. This is so beautiful! 🙂 I hope I could visit it one day! I just see this place on the internet. That’s so amazing and inspiring that you are sharing these moments with your family! Your kids will look back someday and remember what an adventure they went on! So cool!! Incredible! I love the photos and have always been so intrigued by this area of South America. What an amazing helicopter ride it would be! I hope you get a chance to see the falls! They are even more wonderful in person, especially for kids! Which side you preferred the Brazilian or the Argentinian? I loved the Brazilian side most, it was also much more organised so better to go with kids. Nice pictures by the way! What an amazing place to go visit! I love that they have so many hiking options to get to the falls. And the boat ride sounds so fun! It’s a shame the kids were too young. What was the age cut off? That waterfall is gorgeous! Wow! You are so lucky to have seen it in person. What a beautiful place. Oh…would love to take my kids there one day! What an incredible place! I want to visit to badly! 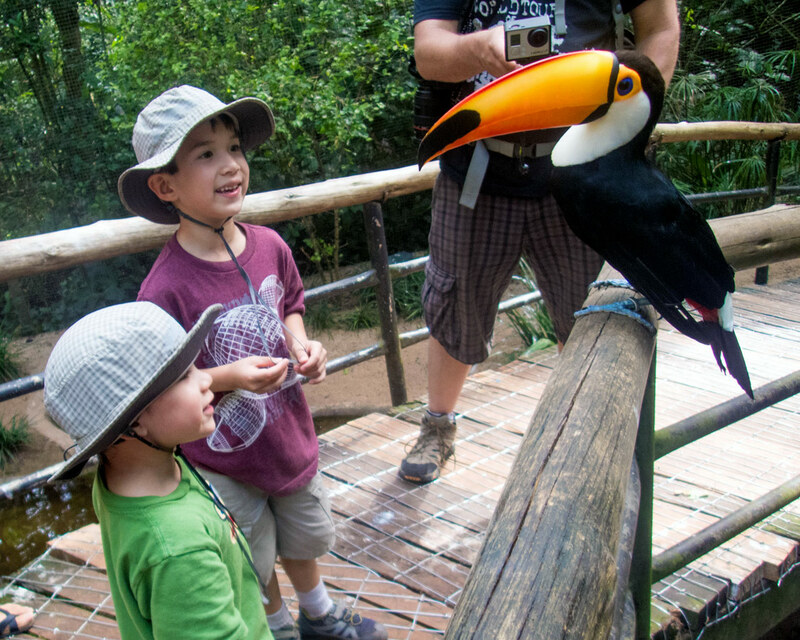 The Macuco Safari sounds like a lot of fun- too bad you didn’t get to take the kids though! Brilliant post. Great information. Looking to head to the Americas with our two young kids. This article definitely helps make that decision possible. The photos are also great. Well done on taking those. Very inspiring. Thank for the informative and entertaining read. Fantastic that you are thinking of bringing the little ones over. There is much to see that would be incredible for the whole family! My daughter did a student exchange in Argentina for 2016 and visited Iguazu Falls. Between her photos and now yours, I cannot wait to go and see it for myself. What an experience overall, but especially for your kids! 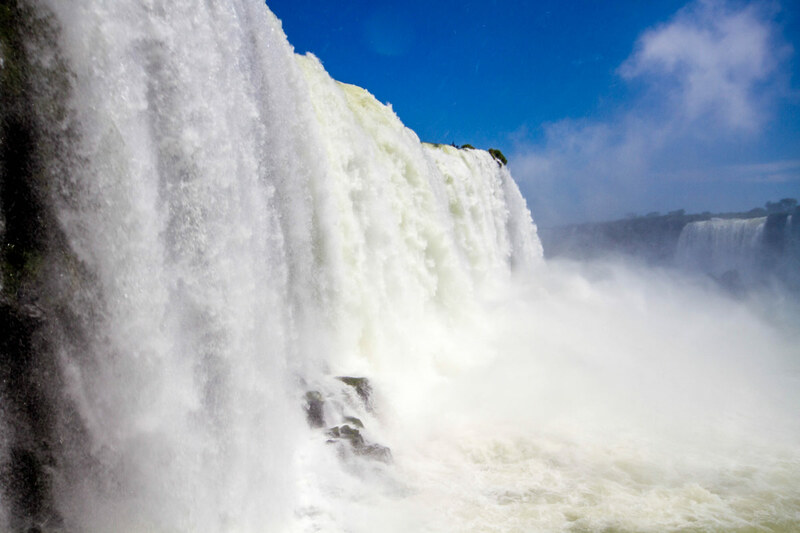 Iguazú Falls looks like an amazing experience. Thanks for including the visa part, I think US citizens need it as well. Thanks for your detailed virtual tour. Glad to hear that you got some good information! US citizens do need it as well, although the costs may vary from those of us Canucks. Really pretty. Something I would love to see in person. I am sure anyone would love to see this. Wow, the Iguazu Falls are simply spectacular! Thanks to your motivational post, I am adding them to my bucket list, Kevin!